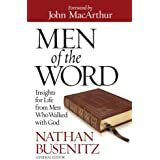 This book includes 15 chapters on various men of the Bible – each aimed at developing a particular Christian virtue. Easy to read and follow. Excellent resource for private devotions – especially aimed at guys from high school and up.